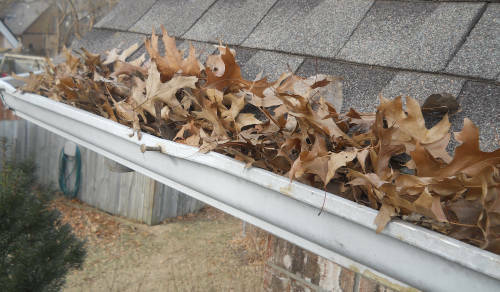 Experts recommend cleaning gutters out at least twice per year - once in the spring and again in the fall. This is because leaves and other debris can fall and get trapped in your gutters and downspouts, causing clogs when rain falls and snow melts leading to water damage to other parts of your home including your foundation. While it may sound easy to get the ladder out and do this project yourself, it's best to leave this job to the professionals to avoid injury or damage to your gutters - especially if you have a high roof. Enter your zip code and let HomeAdvisor connect you with gutter cleaning services near you who are ready to help. "A team of 3 came same-day for a clogged gutter/downspout and gutter cleaning. I got a call when they were running a few minutes late. They unclogged my downspout, cleaned all the gutters thoroughly(3 stories) by hand (no leaf blower), tested all downspouts, hauled away all debris, and cleaned out two window wells. Jamie was direct, professional and thorough. Will absolutely use them again, and recommend them highly." "Jose is great. Very capable and provided several solutions to our repair. Estimates are reasonable. Did a great job replacing our gutter and rotting fascia board. The addition of new gutters and painting the fascia to match the house trim really upgraded the look of the house. Thanks Jose!" "Great guys, gutters clean! " "I had my house gutters cleaned. Mainor was very professional, honest and smart! He was able to help me with a problem I thought was related to the gutters and had been trying to get fixed off and on for many years. At least 3 previous people did not see what the problem really was until Mainor and he fixed that for me too." "Clean Gutters & Downspouts I would highly recommend." "Progress did an outstanding job doing gutter repair and cleaning on my three story townhouse. The work was completed on schedule and the gutters are now functioning as if they were brand new. I highly recommend their gutter cleaning/repair services." "Did a thorough cleaning of my gutters and downspouts. Very professional, showed up at agreed on time and no mess. I will call them again next time I need this type of service." "Prompt went the extra mile to make sure my gutter issues were solved"
"I was skeptical about the efficiency of gutter protection, but all my questions were answered with explanations and demonstrations comparing their product with other (more expensive) brands. Plus, they gave a perpetual warranty which transfers when I sell my house. The installation was completed in a most timely manner, and all the mess was cleaned up as the work proceeded around the house. I couldn't even tell that they had been there except for the fact that the gutters and downspouts flowed freely when it rained the next day." "The gutters were done but the downspouts were not check"
"Lennon&#39;s Home Renovations was very responsive to my request and completed the work within 5 days of my request. excellent customer service and workmanship. " "Jose and his crew are professional and pleasant, and their attention to detail is amazing. They power washed my house and stained all my decking using quality products. I had quite a bit of dirt and mildew on the siding, and they removed it all with care. Also, Jose is great about communicating his plans for the project, and he kept me updated on changes in scheduling due to the weather. I always know what to expect, and when. He made this project pleasant, and his prices are very reasonable. Great job, Jose!" "Extremely detailed and thorough. Excellent job. Timely and came on target. Very knowledgeable, great ideas. Dynamic and high performance person. Great price"
"They were quick and very good. Did exactly what I was looking for and at a very reasonable price! I will call them again!"